I was recently planning a trip and beyond noticing price differences between major airlines, I also noticed how different the visual layouts were and how some manage to be more effective at getting the potential customer into the booking process with less confusion and pushed down the stages of booking with less friction. Usability is of critical importance for any travel booking website let alone an airline that will be receiving thousands of bookings per day. Surely some of these customers are not making it all the way through the booking process. My goal was to get as far down the booking process of each airline (without actually buying any flights) in order to test the airlines for usability. So I went through the motions as if I was booking a flight on Delta, Virgin America, Qantas, Emirates and Singapore Airlines to any destination that took my fancy. 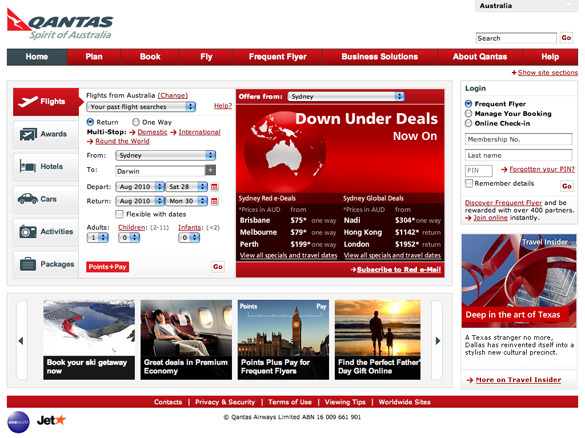 Delta’s initial screen is visually gorgeous and the initial booking form is stripped back to the bare essentials. Pictoral scenes load onto a clickable slideshow with two blank entries: “From” and “To” and as soon as the field is clicked on the entire form appears and even then the form is spaciously laid out. The left aligned form then uses an Ajax-style script to predict where I was coming from as I typed. The city I was going to was treated the same way. After selecting my dates on the calendars, I was shown my choices for flights. Delta use live chat as the way to help people book their flight once people have entered the booking process. All up, booking a flight on Delta is a 4 step process which is actually very compact. Its worth noting that its not all fancy clicks, ajax and technical stuff; Delta use their unique selling points to get visitors to start the booking process and get them over the line. 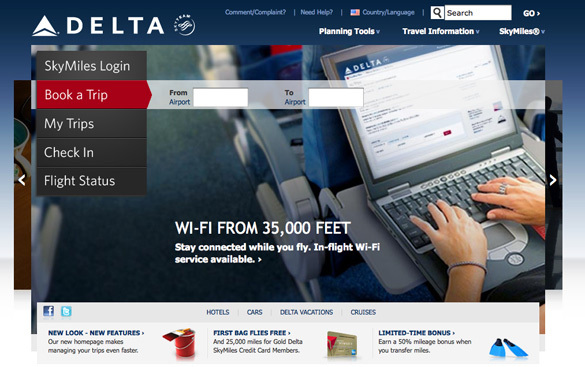 Delta boasts that these results are the best Delta flight prices on the Internet, or I can get my money back. One of the other big selling points was the WI-FI available from 35,000 ft. Page load times are critical for the success of a website’s usabilty for customers and also for search engines. Surprisingly, Virgin America was a bit on the sluggish side slowing an E grade according to YSlow. Moving onto the visuals, Virgin America has a slimline, left-aligned flight booking panel, styled in Virgin’s typical red color, that floats over the main feature slideshow offering the latest deals. When the user clicks on the drop-down to select the departure city the booking form expands down – a brave and novel move for such an important element. The rotating slideshow might look like an Adobe Flash slideshow but thankfully it isn’t, meaning of course that the site is fully operational on iPhones and iPads. Getting into the booking process, its a 7 step process from start to finish. Like almost any flight selection step there are multiple flights per days and multiple cabin classes or fare types. The result is that this stage can get overwhelming for customers with so many checkboxes to chose from. In an effort to cut abandonment the trip summary floats down the page as you scroll down meaning you can also always see your chosen flight times and total fare. Interesting, the trip summary box hangs a small banner beneath to promote their on-board WiFi as a way to get customers to the end. Virgin America also have click-to-chat technology at the booking stage to help customers if they need it. 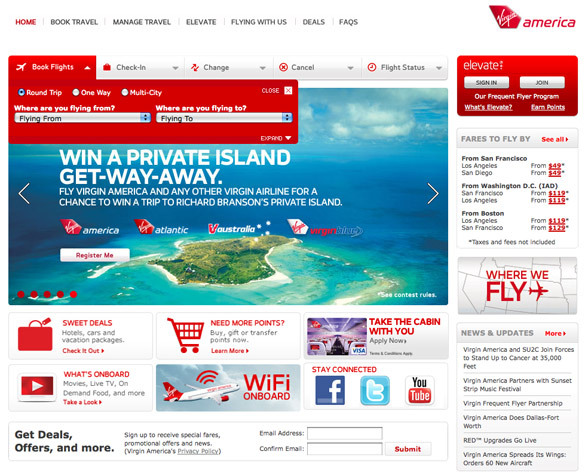 Qantas’ site is tidy and well-constructed. There is a lot of information arranged in a way that left me feeling like everything was competing for my attention. The flight search box is part of a tabbed area on the left hand side of the page which is quite the norm for booking sites to do. The search button is actually a uses the word ‘Go’ and its not very prominent – so you could miss it. The flight selection page is a bit stark but well laid out despite every flight on departure and arrivals dates being segmented by four fare types. This makes for a busy page requiring a lot of attention from customers to click the right checkboxes. Attention is drawn to flights with low seat availability by a flashing “hurry” graphic which was a helpful touch. The entire booking process takes 6 steps which is on par with other airlines. Qantas are keen to promote their Qantas Frequent Flyer program throughout the booking process making the proposition that bit sweeter. Emirates lets me know immediately that they fly worldwide similar to British Airways. 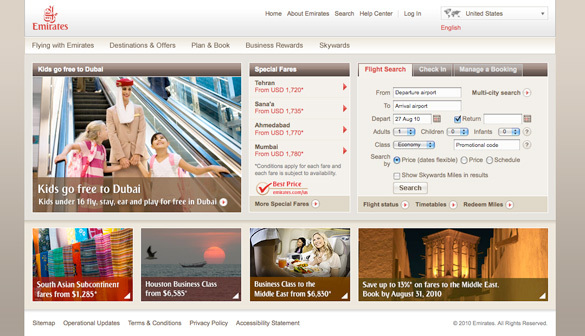 Some usability experts will say that the landing page at Emirates.com is an extra step in the booking process and therefore bad. However, despite this, it does its job well by allowing me to choose my home location and then see only content relevant for my location. The site loads up relatively fast. YSlow grades Emirates as a C which is a very respectable score. Moving onto booking that flight, Emirates place the booking form on the right-hand side. The ‘From‘ and ‘To‘ field use predictive text fields to narrow down the choices as you type. Click search and the customer begins a 6 step process to making a booking. The flight search page uses a condensed table to show departing flight and returning flight in one table – akin to a train timetable. They also make really good use of color-coding, rollovers and icons to pack in all of the information into a much smaller space than other airlines do. What I also loved was the ability to view a breakdown (leg-by-leg) of how many Skywards Miles needed to pay for the flight. 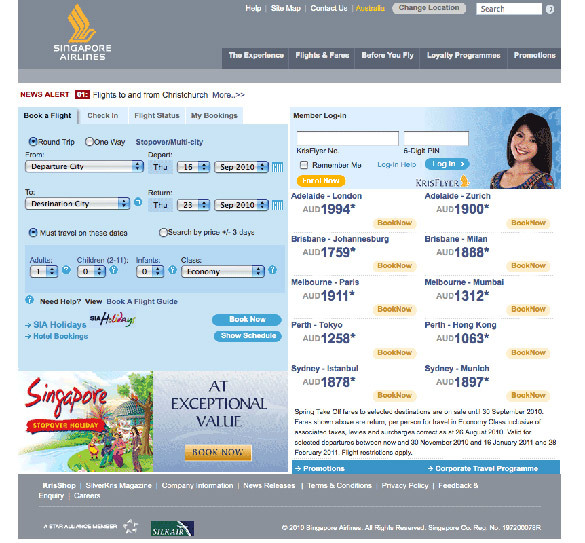 Once through the usual language and location pre-screener, the Singapore Airlines website draws the visitor straight to its unmissable big blue booking form on the left side of the site. Form filling uses drop downs instead of text-fields and predictive text. Any detailed stuff uses popups or tooltips to help explain things. Interesting, at every point in the 6 step booking process Singapore are trying to get you into the KrisFlyer program for frequent flyers, reminding you that its there, showing you how many points you could earn and so on. Whilst Singapore Airlines is a bit dull and the prices are quite high the booking process was straightforward. Page load times have to be fast as possible. Use a free tool like GTmetrix.com to score your website for speed and get a breakdown of what to fix. Don’t forget to address your customers pain-points during the booking stages. Don’t assume they can do it without help. Its not all about nuts and bolts of great design and usability. Use promotional wording and images to draw the customers through to the payment page. Don’t confuse customers about what stage they are at in the booking process. If they know that there’s only 1 – 2 more steps to go before they confirm a booking then they are more likely to complete the booking. Ideally customer support via click to chat to answer questions. Take your opportunity to up-sell your customers into loyalty programs or extra items. This guest post was contributed by Frequent Flyer Credit Cards, the travel website for Australian jetsetters interested in earning points on the Qantas Frequent Flyer program and other airline loyalty programs. Thanks, good review of airline websites. Good post. I like your key takeaways. It could be interesting to look at travel sites too, like Expedia, Kayak, Opodo etc. excellent experiment. were you logged in? did they ask for traveler info in the step-by-step processes? Thanks Jacqui for the compliment. I remained logged out of all of the tested websites for 1 main reasons: I wanted to arrive on the site just like a first time visitor would do. Ryanair should have been mentioned here. One of the worst web sites ever. Other than that, brilliant article. @Flow – I’d actually love to do more critiques of airline websites of really bad ones such as RyanAir and EasyJet from the UK and JetBlue from USA. You will need some sort of action on the bar on the right. This was an interesting post, thanks! As others have mentioned it would he interesting to extend this review to other areas of travel or maybe platform? Have you looked at the mobile offering from any of the above? Either mobile web or apps? I’d like to understand why you have chosen your takeaways, i.e. ‘The best booking processes aren’t by necessity the shortest’. I don’t see any contextual feedback in the article on why you chose to highlight this? @Ben – I restricted my testing to these 5 airlines on the web platform only due to time constraints. I’d love to do more of course. As for my takeaway on the shortest path, I hilighted in all of the points how many steps it takes to get from the initial search stage to payment. Emirates, Singapore, Qantas had 6 steps to book a flight, Delta was only 4 and Virgin America was the longest with 7 steps! I actually thought Virgin’s was one of the best even tho it had 7 steps. Don’t forget that it all comes down to the business needs of the airlines to figure out how much information that they need from the consumer, i.e. if selecting your seat becomes a required part of booking a flight then straight away you’ve got an extra step. Hope this helps. Great post. Thanks for sharing your insights and conclusions with us.